Stay up to date with all the comings and goings in the transfer window with CNN.com’s daily wrap of all the latest rumors and gossip from Europe’s sports pages. LONDON, England - Arsenal pair Cesc Fabegas and Robin van Persie could be set to follow former Gunners Thierry Henry and Alexander Hleb to Barcelona, according to the Daily Star. 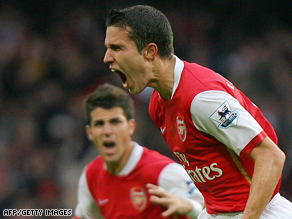 Robin van Persie, right, and Cesc Fabregas: Barcelona-bound? The Spanish giants are preparing a euros 50 million summer swoop for the pair, the report said. Jose Mourinho's Inter Milan are also chasing a pair of Arsenal midfielders - Emmanuel Eboue and Abou Diaby - according to the Daily Mirror and the Daily Telegraph respectively. Inter could also make a move for Sampdoria forward Antonio Cassano and are ready to pay up to euros 18 million if Genoa continue to reject their advances for Argentine forward Diego Milito, the Gazzetta dello Sport reports. But Tuttosport says Sampdoria have already agreed to sell Cassano to Juventus. Real Madrid's Portuguese defender Pepe says Manchester United's Cristiano Ronaldo has told him that he still wants to join him at the Bernabeu, As reports. Villarreal goalkeeper Diego Lopez is the subject of a three-way fight between English rivals Manchester United, Manchester City and Arsenal, according to Marca. Also in the Premier League, Manchester City have made a formal inquiry for Blackburn's £15-million valued Paraguayan striker Roque Santa Cruz, according to the Times. Portsmouth want Newcastle's Joey Barton as a midfield replacement for Lassana Diarra following his departure to Real Madrid, the Daily Mirror says. Portsmouth are also considering Le Mans goalkeeper Yohann Pele as a longterm replacement for England No. 1 David James. Newcastle, meanwhile, could make a move for Glasgow Rangers midfielder Barry Ferguson, according to the Guardian. At Tottenham, Lyon's Brazilian striker Fred has emerged as a possible target as Harry Redknapp seeks a strike partner for new signing Jermain Defoe, the Daily Mirror reports. Spurs are also seeking reinforcements at the opposite end with the Telegraph reporting the club's interest in Polonia Warsaw goalkeeper Sebastian Przyrowski. We (Arsenal) just cannot lose these players at all. I have been a keen fan of this club since the late 80 and have kept my faith with it during all times. If Arsene allows this to happen, I and many other Kenyan Fans will seek a new home altogether. Same will result if Arsene should leave. ...Mr. Marrinka, you are always welcome to the Merseyside. We feel your pain...cuz yo currently drifting ALONE. You will never walk alone when you finally confirm that SPLIT! i will advice arsene to make big money by selling these players but he should get good replacement for them. Why is it that the gossip always has to do with Arsenal selling players? No gossip about buying more? Arsenal cant afford to lose more players again this season. I hope Arsene Wenger is keen on solidifying and building a strong team for remaining part of the season and the future. Arsenal has lost grip, both in style of playing and in motivating their players. If we (the champ of champs) get that assault boy, then m sure we will shoot in more cups and defend what we already stocked. I have no stomachache about how colourful we display our game. Barca is a real club. Come on Gunners, stop playing in that "big Red urinal" and get a lil' bit of the glory. it is a pity that the gunners are selling their best players, but at the moment Barca is one of the best, so it just a matter of best for the best. Anyway Arsenal fans are welcome to Anfield.